Specialized in designing and constructing large scale palm oil milling plant including all machines to manufacture palm oil to international standards. The capacity ranges from 3 tonnes to 60 tonnes of FFBs per hour. 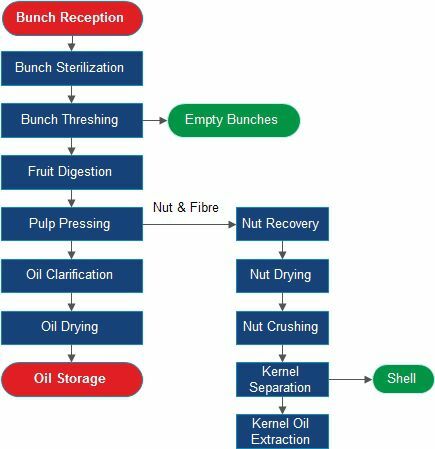 Our palm oil mill projects are designed with mechanical handling systems including pipelines, pumps, screw conveyors and bucket. The mill is specially designed for palm oil milling production, featuring of high automatic and continuously operation. ● Palm oil refining machine enables high quality edible vegetable oil refining processing from crude palm oil efficiently. We assure the most precise design, high quality Palm fruit threshing station Machine, mature project installation, and perfect after sale services.